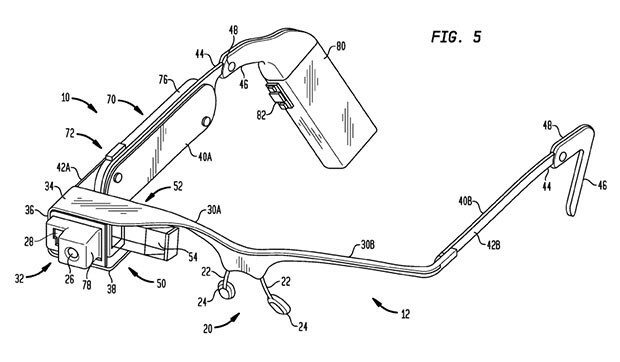 Along with a lot of publicity, Project Glass from Google has generated a bevy of approved patents and applications, but the latest one shows that the search giant's trying to wrap up the whole kit and kaboodle -- replete with detailed diagrams and descriptions to back it up. Specifically, Mountain View is claiming the design of the frame itself including the bridge, brow portion, transparent display, input device plus the means for affixing everything. There are detailed descriptions of how the device can be configured -- for instance, one claim states that the screen could be adjusted "normal to the focal center of the eye," and the position of the electronics placed "over a first side of the ear." It goes on to explain the need for a balancing weight "over the second side" of the same ear in the latter case, such that "a majority of the overall weight is applied" to one side, which certainly jibes with some of what we've seen. That's just for starters, though -- head after the break to see more diagrams and details. 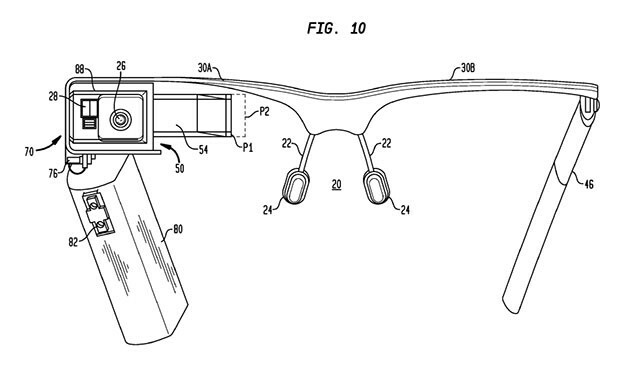 As for the guts of the device, Google says that the on-board computing system could be "wire- or wirelessly-connected" to other components," and states that the video camera, while shown positioned on an extending side-arm, could be placed on other parts of the frame as well, and even that more than one video camera could be used. It further suggests "an augmented reality where computer generated images appear to interact with the real-world view" could be generated, which would be a step beyond the map overlays we saw earlier. Also shown is a sensor which could contain a gyroscope, accelerometer or other sensing devices, along with a finger-operable touch-pad and a display system that projects an image onto the familiar extending side arm, or onto the "inside surface of a lens element." The patent application goes on to illustrate some of those design configurations, and describes different elements like the composition of the display ("transparent or semi-transparent matrix display, such as electroluminescent display or liquid crystal display") or even "a laser or LED source and scanning system (that) could be used to draw a raster display directly onto the retina of one or more of the users eyes." The design also details radios that could be used like WiFi, LTE or Bluetooth, along with possible storage options, battery configurations -- and far too much else to mention in a single article. Naturally, some or all of this may never end up in the final product and could be a case of Google trying to protect as much IP as it can. Still, if you're in a technical frame of mind, feel free to hit up the source.